절기 관련 자료를 보실 수 있습니다. *히브리어 읽기: L' Shanatovah tikatevu ! *의미: May you be inscribed(in the Book of life) for a good year ! - 당신의 이름이 생명책에 기록되는 좋은 한 해가 되길 빕니다. 일반적으로 테키아를 불고 세바림, 테루아 그리고 테키아 하-가둘로 마친다. 나팔을 부는 순서는 다양한 유대인 전통에 따라서 달라질 수 있고 또 부는 시점 또한 로시 하샤나중 다양한 시점에 불리울 수 있다. (예를 들면 예배 시작 때, 토라를 읽은 후에, 그리고 아미다 축복의 읽는 부분이 끝났을 때 등등) 로시 하샤나가 안식일과 겹칠 경우, 쇼퍼는 불지 않는다 (쇼퍼를 움직이는 것이 노동으로 간주되기 때문이다) 이 경우 로시 하샤나의 두 번째 날에 쇼퍼를 불게 되어 있다. (다른 대부분의 유대인 명절과 같이 로시 하샤나도 이틀간 진행이 된다. 신월절이 시작하는 정확한 시간을 가늠하기 어렵기 때문이다) 쇼퍼를 부는 사람은 바알 테키아라고 부른다. The order of the blasts may vary according to various Jewish custom, and they may be heard at different points in the Rosh HaShanah service (for example, at the start of the service, after the Torah reading, after reading parts of the Amidah blessings, etc.) 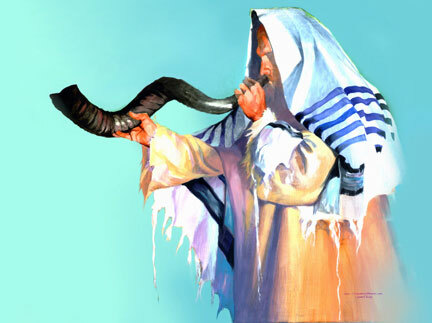 If Rosh Hashanah happens to fall on a Shabbat, no shofar blasts will be heard (since carrying a shofar is considered work) but the shofar will be sounded on the Second Day of Rosh Hashanah (this holiday, like most Jewish holidays, lasts for two days because of the difficulty of determining the exact time of the new moon). An expert in blowing the shofar is called baal tekiah, by the way.